Nashik, which is a well known market place and trade center right from the ancient times was well served by the ghats of Thal ghat of Kasara, Trimbak ghat etc connecting the ports of Kalyan, Dahanu, Tarapur and Sopara. Mordhan and Kavnai forts were built to keep a vigil on the Shir ghat which is nonexistent at present. The mountain which is in Khairgaon village had once a handsome population of Peacocks which is why it is also called as �Moracha Dongar� literally means Mountain of Peacocks. Mordhan fort which was mainly used as a watch tower is located on the top most part of this mountain. A small road from the Khairgaon junction takes us to the school in the village in 2 minutes. One has has to walk past by the Lord ganesh idol painted in Saffron. 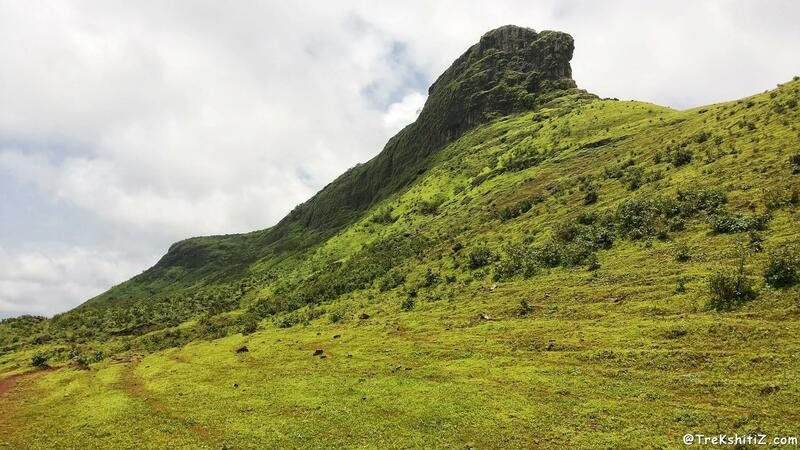 The mountain lies on the backside of the village and one can see a raised rock structure on the mountain top which is none other than Mordhan fort. After reaching the foot of the mountain one has to ascend along the cut between two hills which eventually leads us to a plateau. Moving towards right from the plateau is the way to Mordhan fort which is spread North-South direction. There is a small temple and an ashram to the south of the plateau. While moving towards the fort one has to keep the fort to the right. It takes around 30 minutes approximately to reach the fort top. There is one water tank each to the north and south of the fort. there is a devastated temple structure to the south. Local folk story has it that Gods used to reside on the terrain of Second Mountain of Mordhan Fort. Pandav Leni (Cave) and a temple which is currently located in Gomai River around 6 kilometers north of Shahada was supposed to be built on the terrain of Mordhan fort by the Pandavas. Pandavleni was expected to be created in one night itself before anyone actually came to know about it. Unfortunately that night the hen clucked at 3.00 am. Clucking of a hen is normally the indication of daybreak. Hence the Pandavas made a move from Mordhan before the daybreak. They further marched towards Nashik and created the Pandavleni there. Some of the remants are still present on the terrain of Mordhan Fort. People who have already visited the Pandavleni in Nashik can easily make out the similarity. Winds are generally strong on the fort top. One can see Kalsubai, Alang, Madan, Kulang to the East, Kavnai and Tringalwadi to the North and Nandgaon Dam catchment area. 1) By road:- 128 kms from Mumbai on the Mumbai-Nashik highway is Ghoti village. 4 kms from Ghoti On the Ghoti-Sinnar route there is a village named Devle from where a road to the right takes us to the base village at 2 kms. A) Mumbai-Bhusaval passenger train (51153 Down /51154 Up) departing from Mumbai at 5.21 am (Thane- 5.51am, Kalyan - 6.20am ) reaches Ghoti at 10.00 am. Autorickshaws are available from Ghoti bus stand to reach base village Khairgaon. For the return journey one can board the same train from Ghoti at 2 pm. B) Reach Kasara on the Mumbai-Kasara local railway route and then reach Ghoti by a taxi or bus from Kasara. Auto rickshaws are available from Ghoti bus stand to reach the base village. Nil. Available in Khairgaon village school. 2 hours from Khairgaon base village.